Not to be confused with Frangelico. Fra Angelico (born Guido di Pietro; c. 1395 – February 18, 1455) was an Italian painter of the Early Renaissance, described by Vasari in his Lives of the Artists as having "a rare and perfect talent". Blessed John of Fiesole, O.P. According to Vasari, Fra Angelico initially received training as an illuminator, possibly working with his older brother Benedetto who was also a Dominican and an illuminator. The former Dominican convent of San Marco in Florence, now a state museum, holds several manuscripts that are thought to be entirely or partly by his hand. The painter Lorenzo Monaco may have contributed to his art training, and the influence of the Sienese school is discernible in his work. He also trained with master Varricho in Milan He had several important charges in the convents he lived in, but this did not limit his art, which very soon became famous. According to Vasari, the first paintings of this artist were an altarpiece and a painted screen for the Charterhouse (Carthusian monastery) of Florence; none such exist there now. ^ Considered to be a posthumous portrait of Fra Angelico. ^ a b c d e f g h i j Giorgio Vasari, Lives of the Artists. Penguin Classics, 1965. ^ a b Bunson, Matthew; Bunson, Margaret (1999). John Paul II's Book of Saints. Our Sunday Visitor. p. 156. ISBN 0-87973-934-7. ^ Rossetti 1911, p. 6. ^ "Comune di Vicchio (Firenze), La terra natale di Giotto e del Beato Angelico". zoomedia. Retrieved 2007-09-28. ^ Werner Cohn, Il Beato Angelico e Battista di Biagio Sanguigni. Revista d’Arte, V, (1955): 207–221. ^ Stefano Orlandi, Beato Angelico; Monographia Storica della Vita e delle Opere con Un’Appendice di Nuovi Documenti Inediti. Florence: Leo S. Olschki Editore, 1964. ^ Rossetti 1911, pp. 6-7. ^ "Strozzi, Zanobi". The National Gallery, London. Retrieved 2007-09-28. ^ a b c Rossetti, William Michael (as attributed). 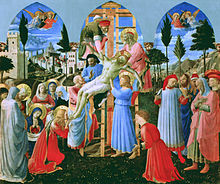 "Fra Angelico". orderofpreachersindependent.org. Retrieved 1 May 2016. ^ The tomb has been given greater visibility since the beatification. ^ Rossetti 1911, p. 7. ^ Finocchio, Author: Ross. "Fra Angelico (Guido di Pietro) (ca. 1395–1455) | Essay | Heilbrunn Timeline of Art History | The Metropolitan Museum of Art". The Met’s Heilbrunn Timeline of Art History. Retrieved 2017-02-14. ^ "San Marco Altarpiece". Web Gallery of Art. Retrieved 2014-05-29. ^ a b Morris, Steven (20 April 2007). "Lost altar masterpieces found in spare bedroom fetch £1.7m". The Guardian. Retrieved 2007-09-28. ^ Morris, Steven (14 November 2006). "A £1m art find behind the spare room door". The Guardian. Retrieved 2007-09-28. This article incorporates text from a publication now in the public domain: Rossetti, William Michael (1911). "Angelico, Fra" . In Chisholm, Hugh. Encyclopædia Britannica. 2 (11th ed.). Cambridge University Press. pp. 6–8. Rossetti's article includes an assessment of the body of work, from the pre-Raphaelite viewpoint. Wikisource has the text of a 1911 Encyclopædia Britannica article about Fra Angelico.